I hope everyone is well. Can you believe we are nearly midway through February already! Where is the time going! Chinese New Year is on the 19th of February this year so I thought I should make a New Year card. 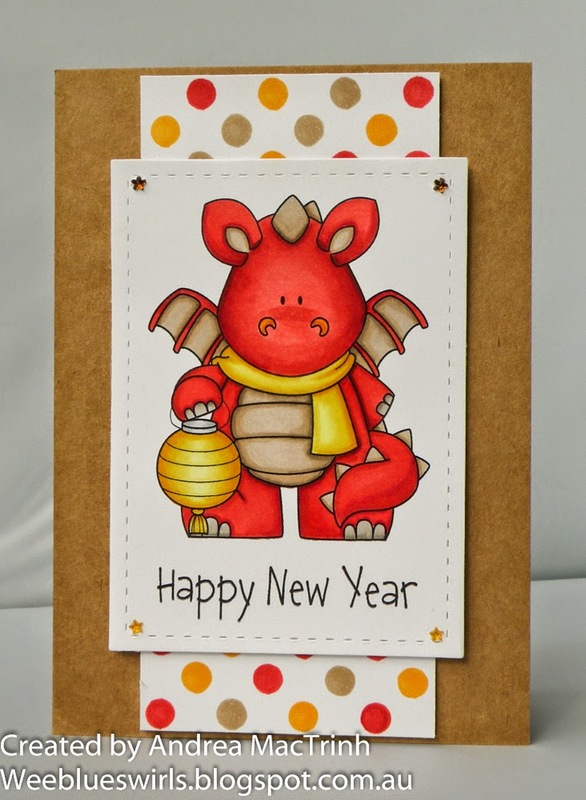 When I think of Chinese Celebrations I think of dragons, red and gold/yellow and obviously lanterns, so that is what I have gone for with my card! This adorable Whimsie Doodles image is only available as part of an amazing collection which you can find here. This card is very CAS but I love the strong colours. I created the background spotted paper with a stencil and some copics to match the colour of the image. The sentiment comes free with the image :) A few adhesive gems and it was done. Nice and easy.